Description: A giant stone statue comes to life to protect the residents of a small town against the depredations of an evil warlord. Tagged 1960s, English, High Definition, Japan, Japanese. Bookmark the permalink. 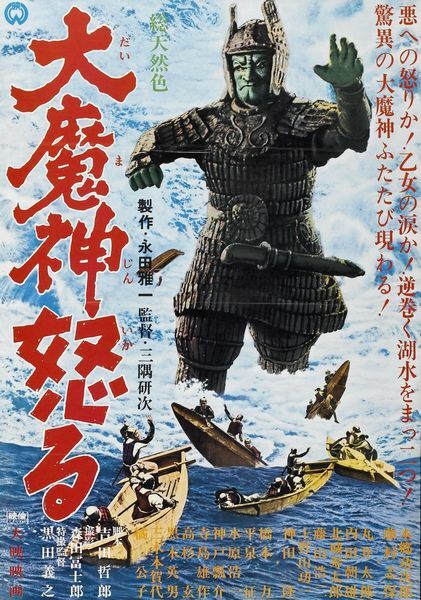 Ever since I first saw this on TV wayyyyyyyyyyyy back (like, about 1970), I was hooked on it’s bizarre imagery of that statue laying waste to those evil shogun. (And, the fact that the original American Dub wasn’t patronizing as well, but acted straight.) Long Live MAJIN, Monster Of Terror!! Thanks, Rarelust–you just keep on rocking!! I love this series, would love ’em all. Thanks a bunch! if you could provide the 2 sequels, that would be grand, thank you!